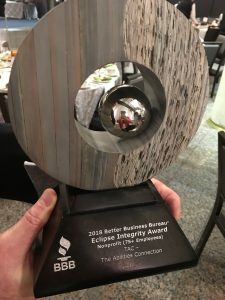 TAC – The Abilities Connection (also known as TAC Industries) was recently awarded the 2018 BBB Eclipse Integrity Award for nonprofits in the category of 75+ employees. 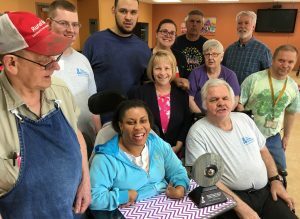 CEO Mary Brandstetter accepted the award on behalf of the board of directors, staff members, and individuals with significant disabilities served by TAC. The Better Business Bureau of Dayton and the Miami Valley hosted the event – now in its 25th year — at the David H. Ponitz Sinclair Center before an audience of 500 Miami Valley business and nonprofit leaders. “I am proud of the work we do,” she said. Eclipse Integrity Awards are presented to nonprofits demonstrating outstanding community service through their mission and accomplishments, excellence in programs and fiscal stewardship, and operating with integrity through ethical leadership and a strong team. TAC – The Abilities Connection is a unique nonprofit in Clark County with a long history of providing employment, community connections, and care for people with significant disabilities. TAC employs over 100 staff members and serves nearly 300 individuals with significant disabilities. People who come to TAC have opportunities to learn basic job and life skills, interact with people, enjoy leisure activities, and actively participate in community life. “TAC roots go deep; our founders sought a place for their children in the community, and we seek to stay true to their mission,” said Brandstetter. “This award is recognition of that effort,” she added. TAC is a vital partner to a number of local businesses in the region, including Rittal, Cascade Corporation, Trutec, and Sweet Manufacturing. Individuals in the business operations part of TAC engage in part-setting, packaging, assembly, metal fabrication, and casting, and cutting/sewing services. TAC also grows lettuce via The TAC Farms hydroponic greenhouse operation, and supplies industrial rags to several local businesses. TAC employees have been repairing cargo nets for the U.S. Air Force since 1984. The organization has since become the sole-source supplier of newly-constructed cargo nets to the Air Force. PHOTO: TAC staff and individuals join CEO Mary Brandstetter in celebrating the Integrity Award recognition.